24 Better Words for Happy. Bright word cards ready to print for writing reference and discussion. A fun way to use these is to ‘grab’ sentences with ‘happy’ out of children’s books and write them down. Children replace the ‘happy’ part with different words – which one fits best? Children act out the emotions involved with feeling ‘happy’ use the different words to discuss sentences about how the children are ‘acting’ using the different ‘happy’ words. 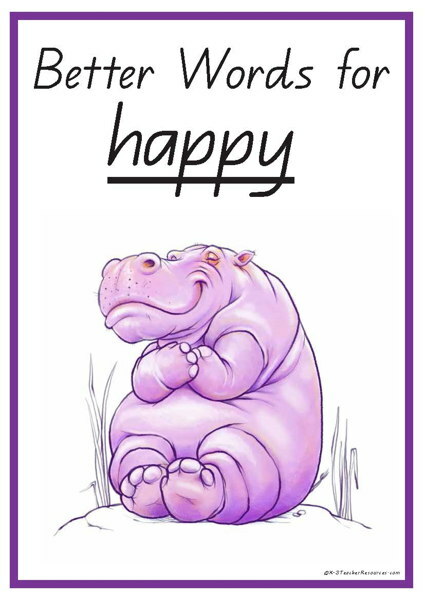 Brainstorm and list more words for ‘happy’ as a class.